Madonna to hydrangeas: bleep you! Madonna and hydrangeas are the talk of the town! Is the material girl sorry for revealing her disdain for the flowers? Not even a little bit. Madonna doesn’t like hydrangeas, and you can’t make her! The singer has posted a video mocking her hydrangea loathing incident that does anything but smooth over the floral freak-out. Watch below! After an incident Madonna’s rep calls “ridiculous” in which the singer can be heard commenting “I absolutely loathe hydrangeas” after being gifted a bouquet, a video response has hit the web. The 46 second silent Madonna hydrangea video, titled Madonna’s Love Letter to Hydrangeas, starts out showing the 53-year-old apologizing to a boquet of the loathsome flowers. Golly gee Madonna, why don’t you tell us how you really feel? 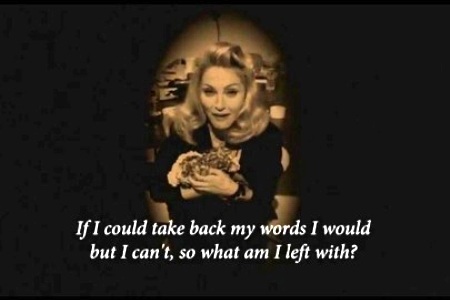 Madonna’s hydrangea apology video: love it or loathe it?